Hey all you people who just finished marching this summer! We're running out of Forzato pics! Hurry up and e-mail your best shots from the summer to dave@dci.org along with where and when the photo was taken. Send some biographical information about yourself as well. We'll give you full credit. Also, let us know if you want your e-mail address included. Joy Rogan sent in this one. "It was tough not seeing the Crossmen in finals this year, but thanks to our friends with Spirit of JSU, the Crossmen were not forgotten at the big show. The above photograph was taken during the retreat ceremony at DCI finals, and is an ever-present reminder of the special bond these two corps share. 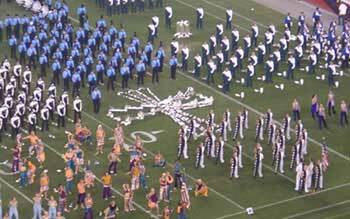 "Just last year, the Crossmen made a "delta" on the field during retreat as a similar show of respect for Spirit, who did not make Finals. Thanks again to the members, staff and administration of the Spirit of JSU. You truly are a class act! Thanks Joy!